It took a week after Lars’ crash to receive the new wheel and for him to re-build it. His injuries have scabbed over nicely but its hard to stop him from picking them! Oh well, onwards and upwards, we were on the road to Lake Atitlan! Carl (our very eccentric Warm Showers host) decided to come along for the ride. 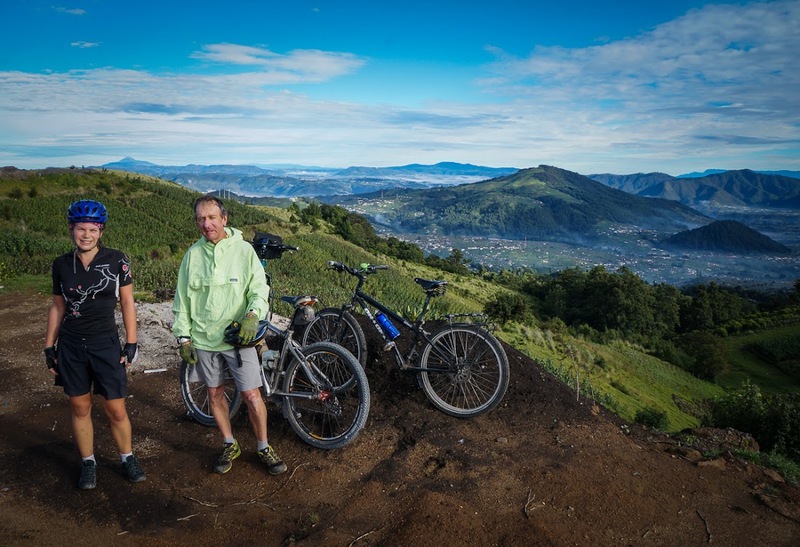 He also arranged for our panniers to be driven down separately so at first light we left San Cristobal Totonicapán free of our weighty possessions for the 71km ride to San Pedro, Lake Atitlan. We cruised along the Panamerican Highway. It’s a nice gradual climb followed by a 400 metre downhill stretch. Nothing too heavy for our first day back in the saddle. We stopped for a break at a lookout known as Alaska. At 3020m, it’s the highest point on the Panamerican Highway. You can also see Volcánes Tajumulco (distant left) and Cuchlachel (near right) in the background. Just before we began our descent, we caught our first glimpse of Lago Atitlán and Volcãn San Pedro. About a third of the way into the ride we turned off the highway and onto a smaller road. It became very steep and uneven. Carl warned us of the pot holes and Lars was definitely riding on the air of caution. It all happened so quick, one minute I was on the the bike and the next I was lying in the road. The loose gravel must have got the better of me and whisked me off my wheels. Luckily I was travelling at a slow speed and managed to get away with just a little road rash and bruised palms. My riding top and gloves have some new holes but nothing that can’t be fixed, I can’t believe we managed to both have a crash in the space of a week! After reading a blog post on While Out Riding we decided to stay at hotel Penelau. It’s a family run hotel that has amazing customer service. The two sons carried all our panniers plus a five gallon water bottle up three flights stairs to our room. It has an awesome view of the lake and all for 60 Quetzales per night. We couldn’t be happier, that’s about five British Pounds! We plan to stay in San Pedro for a few days to take in the atmosphere, and drink a lot of local coffee. I just need to stop myself from buying all the beautiful artisan crafts! 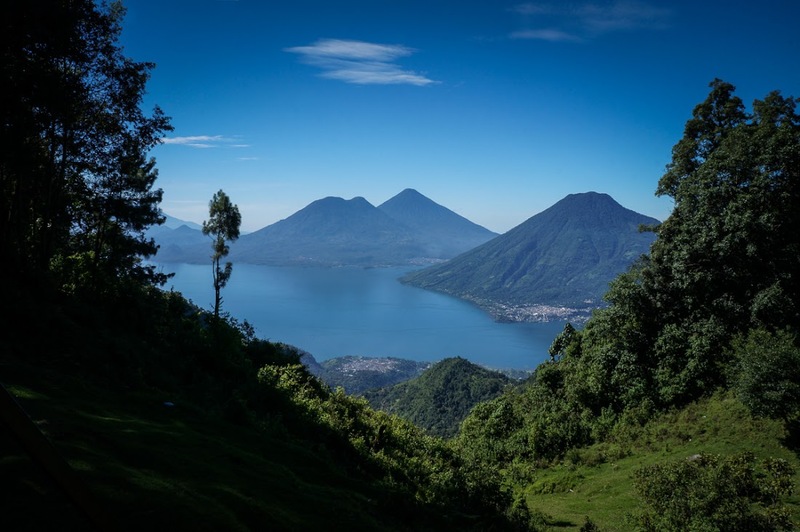 7 Responses to "The Road To Lake Atitlan"
Just started reading about your trip, and we’re really impressed! Lago de Atitlan was a favorite of ours when we visited Guatemala, but we used local vans and buses to get around. Not as athletic as cycling, but certainly still dangerous and adventurous! Oh Jenny…ouchy!! You have become such a tough little mo fo haven’t you? ha ha John, that was a totally “Holler syndrome” thing to say …I can hear lars laughing from here. It’s as though, if I close my eyes, I hear Dad saying that. Lars and Luke learned all about “Holler syndrome” from Eric who coined the phrase. Glad to here you got your wheel repaired and are back on the rode. Thats pretty cool you found an ex pro to help. He can probably build wheels with his eyes closed. Two crashes in a week. That should take care of it for a while. But then you never know when your number comes up. Hey John, great to hear from you. We’re both much better now. It was probably a good thing, because we’re both riding more carefully now! Holler Syndrome, huh! I don’t have it as bad as my mom, but my Eeyore does flair up from time to time.